With charter school transfers expected to jump from $46 to $55 million in the next school year’s budget, the school board narrowly passed a symbolic measure opposing new charter openings. School board member Emanuel Capers proposed the measure which was approved in a 4-3-1 vote last Wednesday. “We can’t afford charter schools taking money out of our budget right now. It puts us in a funding bind,” said Capers of the millions that is transferred every year to charter schools. These transfers to charter schools was cited in the past years as a major cost driver for the district that has led to hundreds of layoffs at the Paterson Public Schools. Capers said the charters schools are opening in substandard facilities. He cites the Barney’s building in downtown Paterson that has been converted into a 22,240 square feet campus of the Paterson Charter School for Science and Technology. If the city’s school superintendent attempted to locate a school in a similar building there would be an uproar in the community, said Capers. “I’m trying to safeguard the interest of an expanding student body. I want to stop a new influx of charter schools,” said longtime school board member Jonathan Hodges. He said the transfers have led to larger class sizes for the district. Charter schools are funded at the expense of “vast majority” of Paterson students, he said. Hodges also cited the letter the Newark-based Education Law Center sent to the state urging it to reject new charter schools in Paterson. 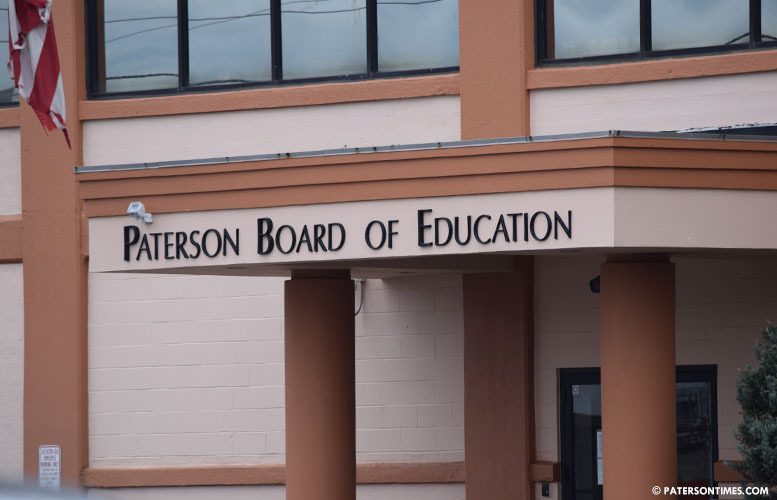 In that letter, the advocacy’s executive director David Sciarra, argues the growth of charter schools has “significantly reduced the essential resources available to educate students” in Paterson school district. After the letter, the New Jersey Department of Education rejected three charter schools — Global Learning Charter, M.C. Adams Public Charter School for Boys, and Paterson Dual Language Public Charter School — that sought to open in Paterson. All three had received approvals in the first phase of the charter application process. Hodges, Capers, Nakima Redmon, and Flavio Rivera voted in favor of the measure while Oshin Castillo, Manny Martinez, and Chrystal Cleaves voted against. Lilisa Mimms abstained. Martinez, who works for the Community Charter School of Paterson, recognized charters have had an “adverse impact” on the district. However, he said he favors school choice. Most of the city’s charter schools do not perform any better than district schools. There are some exceptions like the high-performing high school run by the Paterson Charter School for Science and Technology. However, there’s a false impression that charter schools are academically superior to district schools. School board members said the measure is less a blanket opposition to charter schools and more opposing the way charters are funded. “It’s a pointless resolution,” said school board president Christopher Irving. He was not present at last week’s meeting; however, he said, if he were present, he would have voted against the measure. Irving wants to see charter schools directly funded by the state. He is on governor-elect Phil Murphy’s transition team that is tasked to create a blueprint for education policy in New Jersey. He intends to suggest charters get direct funding from the state. School advocates and activists cheered the passage of the symbolic measure. “At least they took a stand on it,” said former school board member Corey Teague. He had hoped Mimms would vote in favor of the measure and expressed disappointment at her abstention. Mimms, who has been the subject of critical coverage in the Paterson Times, did not respond to a call for comment for this report. Teague said he was surprised by Rivera’s affirmative vote. Oshin "Corrupt" Castillo took a no show secretary job at PCT in exchange for her expansion vote, Manny Martinez works for a charter as the article states, and Chrystal Cleaves is in cahoots with some pastors who want to open a charter so she can get a cushy no show B.O.D job. Lilisa Mimms is a spineless coward who is afraid to take a stand for our children against these cancerous corrupt charters whose sole purpose is to fleece taxpayers either (A) for their Wall St hedge fund managers who funded them (B) to over throw the Turkish government and bring back the Ottoman empire as with the Gulen Charters. Chris Irving who does have a valid point that charters should get state not local funding, BUT They need to be accountable and their books scrutinized and open to the public if they want PUBLIC tax dollars. But that is the whole purpose of charters…directors making more than the MS. Shafer the superintendent, a BOD list that reads like a family tree, scams like "attrition" to increase profit margins, young inexperienced, non union teachers, teachers forced to pay kickbacks (Gulen schools) also the owners starting food services companies to balloon rates which they bill tax payers for. Even the NAACP came out against charters because they create a 2 tiered separate and unequal system that 1954's Brown V Board of Ed was supposed to outlaw. If charters are SO great why arent white towns clamoring for them? Bravo to the brave and courageous 4 who took a stand..kudos..you have my applause. The voters will remember you just like the pro-charter candidates who took their campaign $$ like Fannie Santana who recently lost. As a proud parent of PACS Paterson, I am so disappointed of the Paterson Board of Education's decision to opt out of expanding the Paterson Charter school community! We as parents deserve the right to have a choice in having our children attend better schools that do whatever it takes to help our children achieve at a HIGH LEVEL. The Philips Academy's Staff and Leadership team in Paterson has by far been so patient with my daughter and has personally taken so much time to work with me in achieving one of my main parenting goals, EDUCATION! I have so many friends and family members whose children's names remain on waiting lists to attend one of the 5 Charter schools in our community. We have to do better in our City. Put your pockets to the side… Our next generation depends on it!